Mont Bruno Boxwood is a dwarf, extra-hardy, globe-shaped boxwood. It has tiny, dark green leaves that are smaller in scale than other boxwoods. It grows to a height of 2' to 2.5' and 1' to 1.5' wide. Mont Bruno Boxwood likes to be planted in full sun. 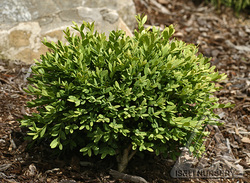 Use this dwarf shrub in a rock garden, miniature garden, container, or as a small hedge lining a walkway or patio. It is also an excellent choice for a Bonsai specimen or topiary. Mont Bruno Boxwood is deer resistant. Cover this dwarf shrub with burlap in very windy sites during winter.